I find great pleasure in preparing biscuits in the early morning hours. They’re very easy to make with just a few simple ingredients. It’s mostly all in the technique, making sure you keep the butter and liquids very cold and don’t over handle the dough. And who can resist a warm biscuit fresh from the oven? To mix things up a bit, I’ve made some biscuits that are baked on top of a combination of butter, brown sugar, maple syrup, cinnamon, orange zest and pecans. 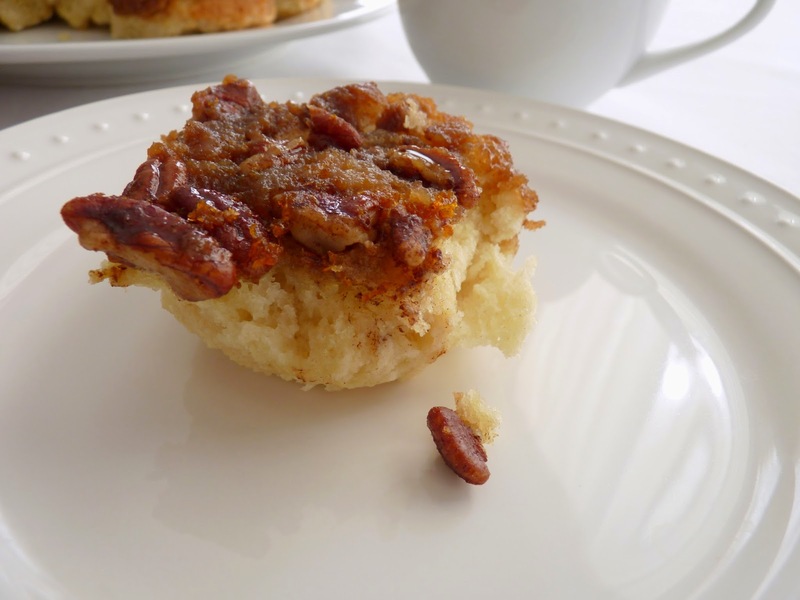 They’re sort of a super quick and less sweet version of a sticky bun without the yeast and the heaviness. The biscuits are made very tender with the addition of buttermilk and plain yogurt. The whole thing bakes in about 20 minutes. This is a fun brunch item for lazy weekend mornings when you can take the time to enjoy the start of the day and indulge a bit. 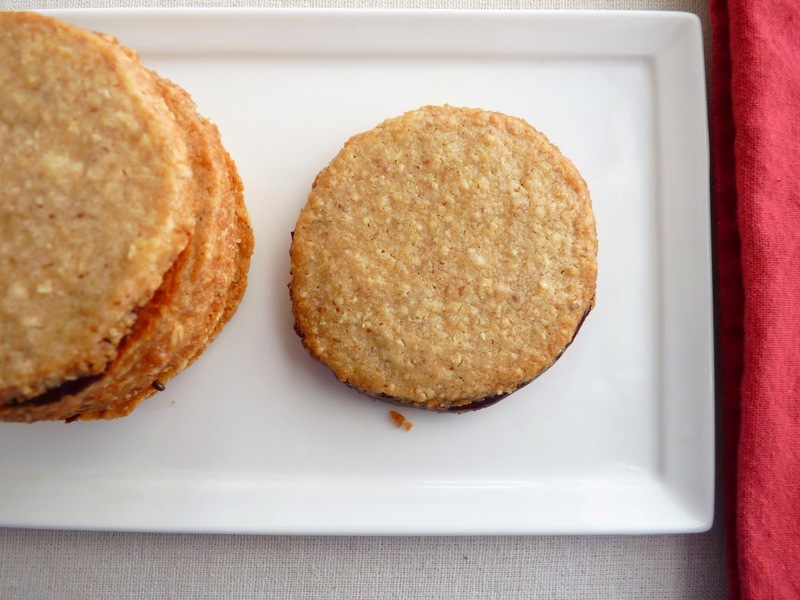 Serve these warm with some coffee and you’ll be on your way. - Lining the bottom of the pan with a circle of parchment makes it much easier to remove the warm biscuits from the pan. When I turned out the biscuits, the parchment stayed in the pan with very little topping stuck behind. - Add a very light sprinkle of salt to the topping if you prefer. - The dough will be soft and moist but not sticky. Do your best not to over work the dough, which causes the butter to warm, toughens the dough and produces a heavier biscuit. - Plain Buttermilk Biscuits or Sweet Potato Biscuits are also fabulous. Preheat oven to 425 degrees F. Lightly grease a 9” cake pan and line the bottom with a circle of parchment. For the topping, place the melted butter in the prepared pan and swirl it around to cover the entire surface. Drizzle the maple syrup on top of the butter. 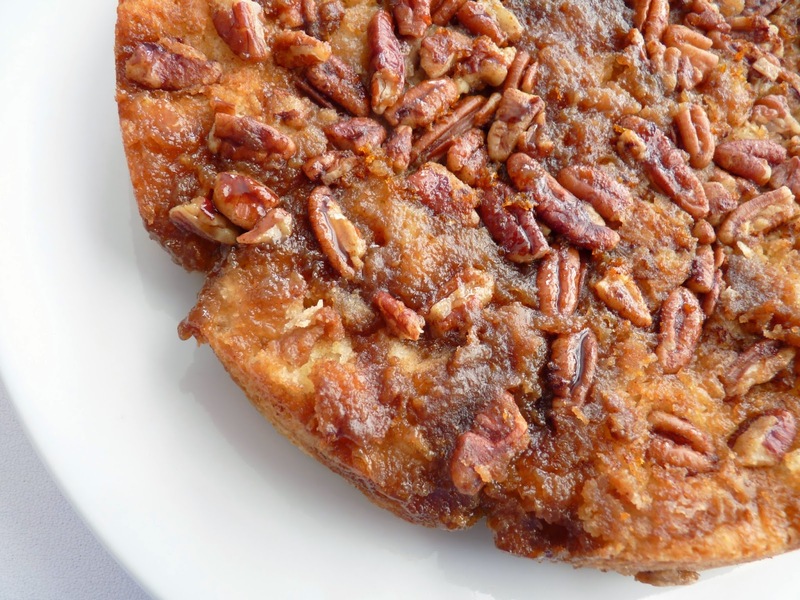 Combine the brown sugar, cinnamon and orange zest and sprinkle evenly on top of the butter and syrup. Top with the coarsely chopped pecans. Chill while you prepare the biscuits. For the biscuits, sift the flour, baking powder, baking soda, sugar and salt together in a bowl. Cut the butter into 1/2” pieces and add to the flour mixture. Using your hands, toss to coat all the pieces of butter with flour. Working quickly with a pastry blender or your fingers, pinch and flatten the butter into the dry ingredients until the butter is the size of peas with some smaller crumbs. Combine the buttermilk and yogurt. Make a well in the middle of the flour mixture and pour it in. Using a fork, fluff the flour into the center and gently stir and turn the ingredients until you have a soft dough. Give it a gentle kneading; about 3 - 4 turns should be enough to consolidate the dough. Turn the dough out onto a work surface that's been very lightly dusted with flour. Pat it into a round 8" in diameter. Use a 2 1/2" cutter to form the biscuits, pushing straight down and lifting up to cut rather than twisting. Place the biscuits on top of the pecan mixture, lining up 8 evenly spaced around the edge of the pan and 1 in the center. Use some of the scraps and fill in any large holes around the center biscuit. Brush the tops lightly with melted butter. Bake until they are puffed and the tops are golden brown, about 20 – 22 minutes. Remove from the oven and within a minute or so, use mitts or a potholder to invert the pan onto a platter. Lift off the pan and gently remove the parchment. Scrape any topping left in the pan back onto the biscuits. Serve warm. I am greatly enamored of spices of all sorts and nothing strikes that note in such a grand way quite as well as gingerbread. Spice cakes and cookies in general are great standouts but the addition of other ingredients like coffee, molasses and stout beer really add an extra layer of intrigue for me. These cupcakes are based on a recipe from Karen DeMasco. They are chock full of a great combination of flavor-rich ingredients that somehow manage to meld beautifully together in concert. After an initial testing, I did change up some of the ratios in her recipe – I decreased the sugar and leaveners; added a bit more flour and oil and an extra egg; changed up the spices and lowered the baking temperature - but the basic foundation is there. 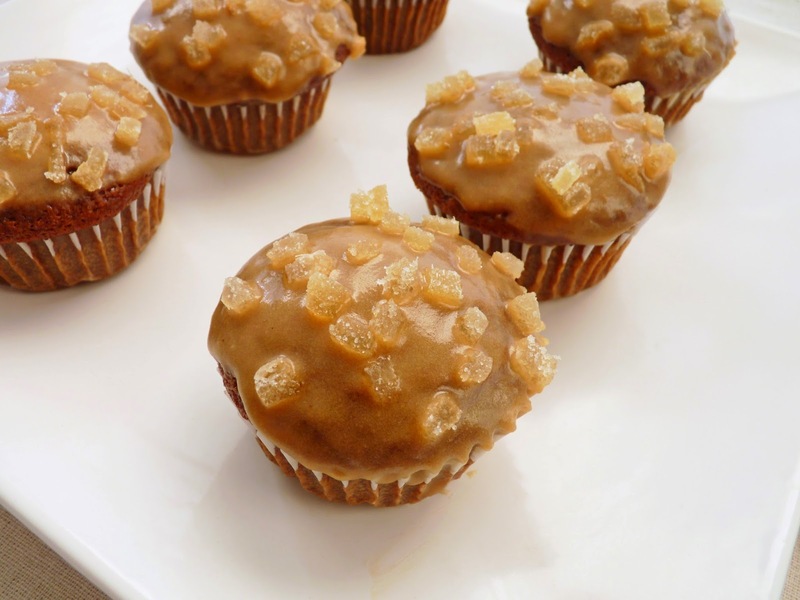 The result is a soft and delicious little cupcake, a fun and satisfying pastry for ginger and spice lovers. The icing is gooey and a bit rich, so a little goes a long way. Just bring along a sturdy napkin and your favorite beverage. - The original recipe is here. - The heated beer, coffee and molasses mixture will bubble up when the baking soda is added, so choose a saucepan that will accommodate this. 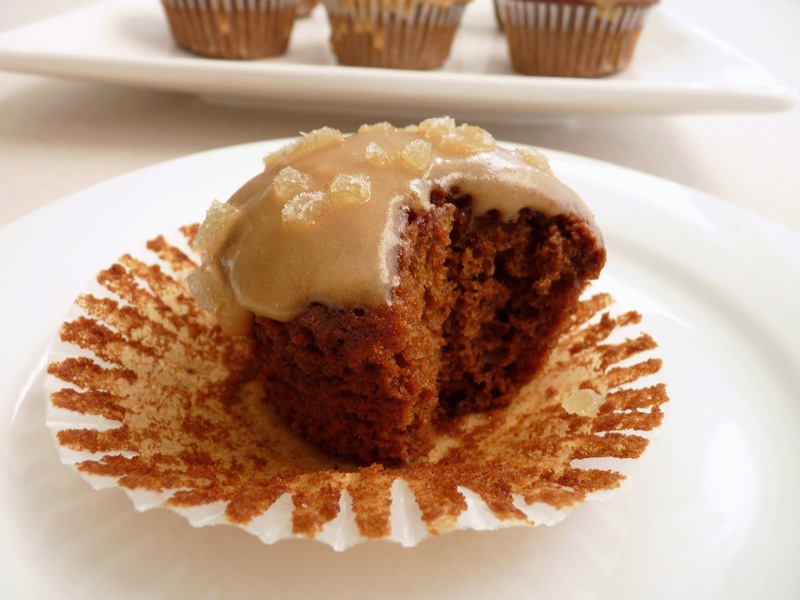 - The icing is gooey so dipping just the peak of the cupcakes will be enough. It will run down the sides to cover the surface. - Adjust the flavorings in the icing to suit your own palate. 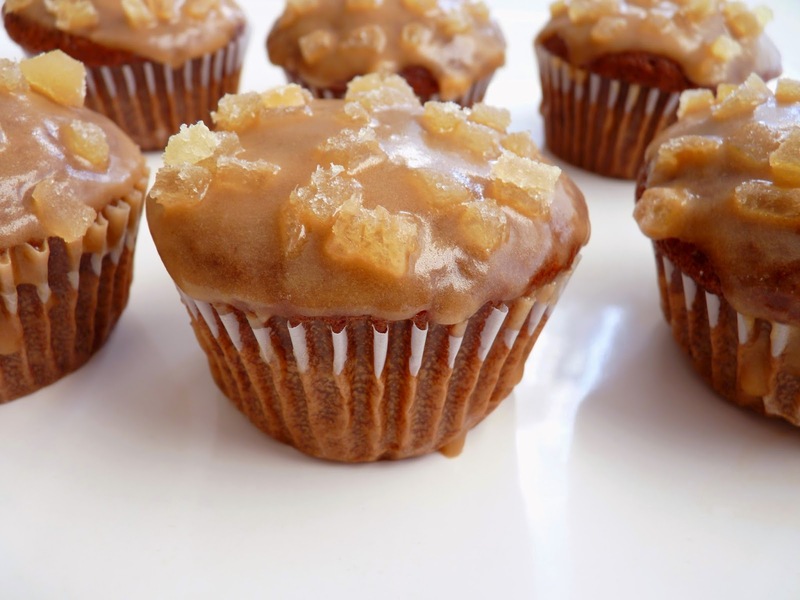 Or skip the icing and enjoy them plain with a piping hot cup of your favorite coffee. - The cupcakes can be kept in an airtight container at room temperature for a day or in the refrigerator for up to 3 days. - More ginger love: Gingerbread Bars, Ginger Chocolate Cookies, Gingerbread Shortcake with Pears and Plum Ginger Upside-Down Cake. Preheat the oven to 350 degrees F. Line a standard 12-cup muffin tin with paper liners along with 6 more cups in a second muffin tin. Bring the beer, coffee, and molasses to a boil, whisking to combine. Remove from the heat and whisk in the baking soda. The mixture will bubble up, so do take some caution. Set aside to cool for 5 minutes. In a separate bowl, whisk together the oil, brown sugar and grated fresh ginger. Add the eggs and combine thoroughly. Add the flour mixture in three additions, alternating with half the beer mixture and beginning and ending with the flour. Divide the batter evenly among the muffin cups. 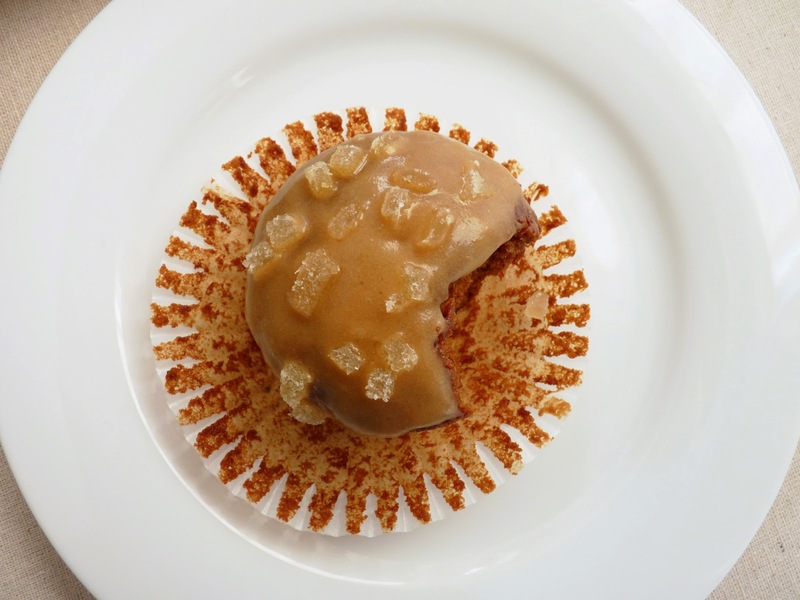 Bake until a tester inserted in the center of a cupcake comes out clean, about 20 minutes. Remove to a wire rack and cool completely. For the icing, sift the powdered sugar. Beat the butter and sugar together until smooth. Add the coffee and molasses. Combine the vanilla and espresso powder and add. Dip the top of each cooled cupcake in the icing. Garnish with finely chopped candied ginger. I’m a huge fan of San Francisco pastry chef, Emily Luchetti. Her recipes are meticulous and trustworthy and the results are always delicious. I still remember an almond cake with quince I enjoyed at one of her venues many years ago. It was absolutely fabulous. I love her celebration of seasonal ingredients and sense of balance when it comes to fat and sugar levels. In my own work, I’ve always strived to emphasize flavor and keep the fat and sugar content just at the level where they provide sumptuous texture without masking other ingredients. It’s something I learned from some of the pastry chefs I worked with and for whom I hold the highest regard. I thought of Emily’s project a few days ago when I saw a recipe for pound cake that looked delicious but called for 12 oz of butter, 8 oz of cream cheese, 3 cups of sugar, 3 cups of flour and 6 eggs, among other things. Honestly, I can’t even fathom that. So Emily’s project resonates with me. You can follow her on twitter, Instagram and Facebook. 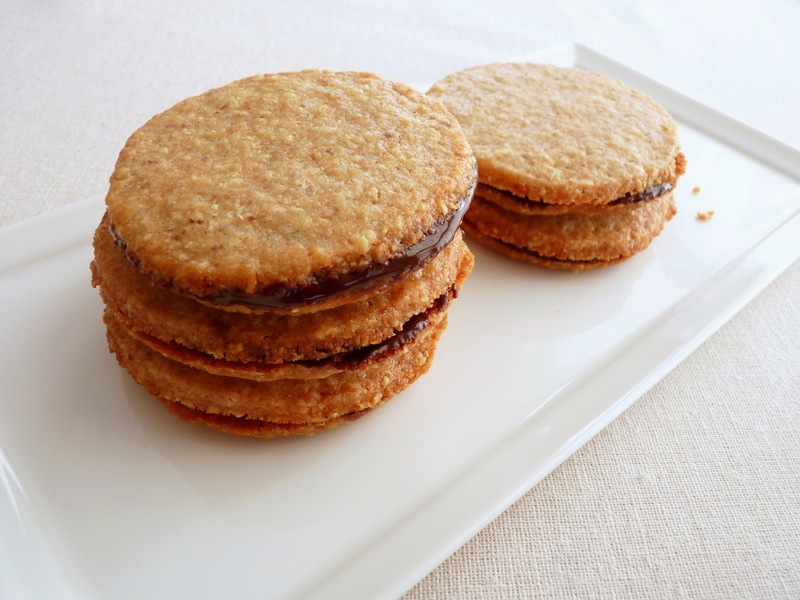 This Oatmeal Almond & Chocolate Sandwich Cookie is a combination of some very basic ingredients that I think are in good proportion. 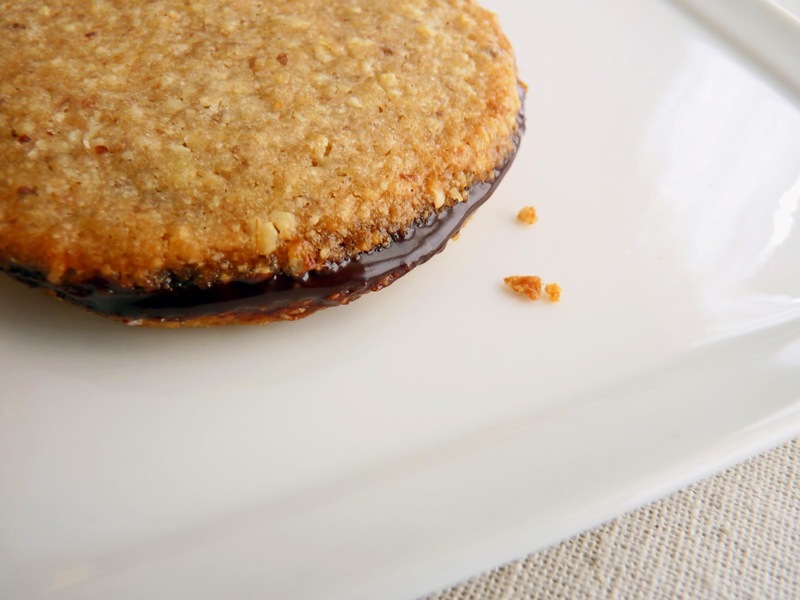 The oatmeal and almonds are ground with a mix of all-purpose and whole wheat flour. It’s sandwiched with a dab of good dark chocolate. And it’s constructed for maximum pleasure, so please do enjoy every bite! - I use old-fashioned oats in this recipe. - I prefer sliced almonds rather than whole because they seem to grind finer in a food processor. - I’m kind of a freak about chilling cookie dough. It helps cookies hold their shape during baking. - If you prefer, roll the dough into logs. Chill thoroughly or freeze. Slice about 1/4” thick and bake. - Add a slight pinch of good salt to the surface before baking if you enjoy a salty cookie. - I like bittersweet chocolate with this cookie but you can use semisweet or a combination of both. 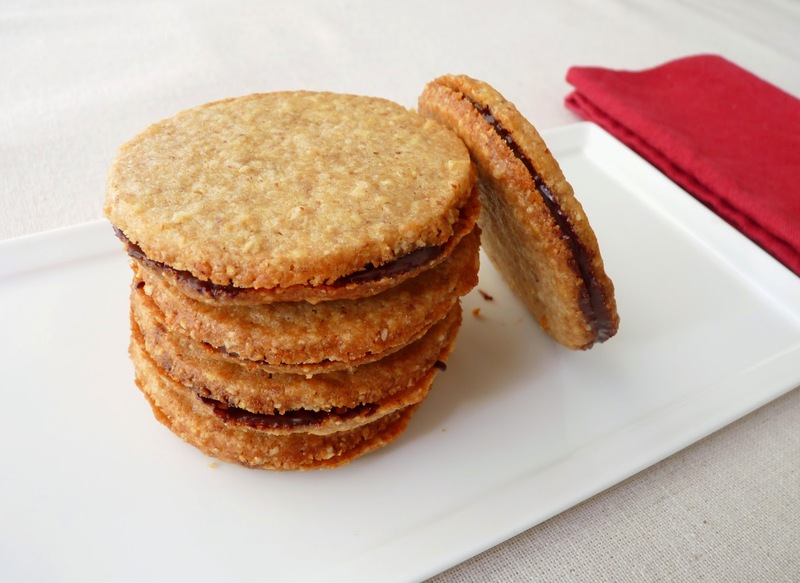 - Alternatively, fill the cookies with a small dab of your favorite jam. - Best "something different" cheesecake ever, Emily Luchetti's Goat Cheese Cake. Place both flours, oatmeal, almonds, both sugars and salt in the bowl of a food processor. Process until the oatmeal and nuts are finely ground. Cut the cold butter into small 1/2" cubes and add to the flour and nut mixture. Process until the mixture looks like coarse meal. Combine the egg, vanilla and almond extracts and add. Process until the dough starts to form larger clumps around the center of the machine and holds together when pinched. Divide the dough in half and place each portion on a piece of plastic wrap. Put another piece of plastic wrap over the top of each portion of dough and flatten into discs. Using a rolling pin, roll out each disc of dough between the two sheets of plastic wrap to about a 3/8” thickness. Slide onto a baking sheet and chill thoroughly. When the dough is thoroughly chilled, peel off the plastic wrap from both sides and cut out cookies using a 2 1/2" cookie cutter. Gently re-roll scraps for additional cookies. Chill while the oven heats up. Place 12 cookies per baking sheet. Bake until just lightly browned around the edges, about 10 - 12 minutes, rotating the baking pans halfway through to ensure even baking. Place the pans on a wire rack to cool completely. Chop the chocolate into very small pieces. Melt butter and chocolate in a heatproof bowl placed over a pot with an inch or two of barely simmering water, making sure the bottom of the bowl isn’t touching the water. Whisk to thoroughly combine. Remove from heat and let cool for about 10 minutes or so. Spread a dollop of chocolate on the underside of half the cookies. Top with remaining halves. I’m pretty sure people who say they don’t like dates have never tasted a Medjool. There are several varieties of dates but Medjools have come into fashion in the last decade because they are large, soft, moist and plump with more of a caramel overtone. Southern European countries primarily consume the Deglet Noor variety as a result of trade with Tunisia and Algeria, where 90% of Deglet Noors are produced. The United States and Israel are the primary exporters of Medjool dates. The California Coachella Valley produces 70% of the Medjool crop in the U.S., which all began with offshoots brought from the Bou Denib Oasis in French Morocco in 1927. The California season runs from the end of August to the end of November but dates keep very well and are enjoyed any time of the year. 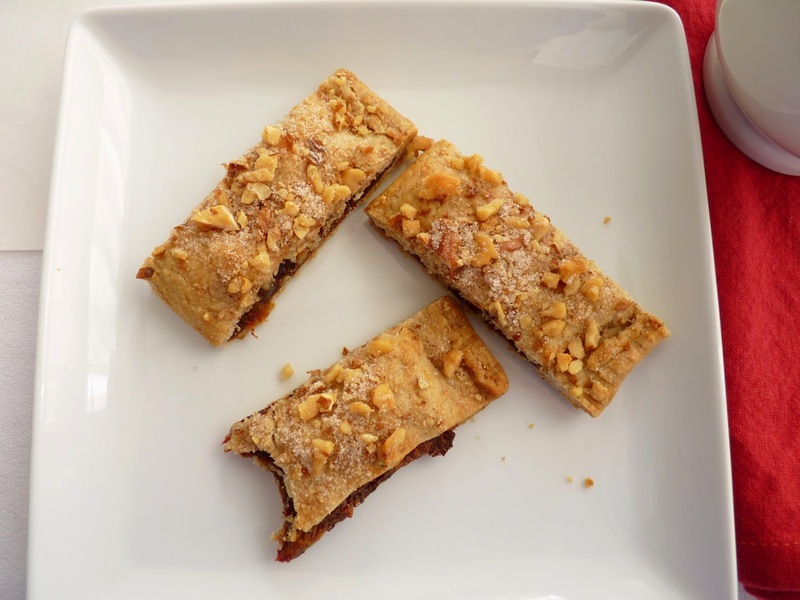 These pastry slices take full advantage of the wonderful marriage of dates, walnuts and chocolate. I simmer Medjools with coffee and a hint of cinnamon and orange zest until they become a chunky paste. 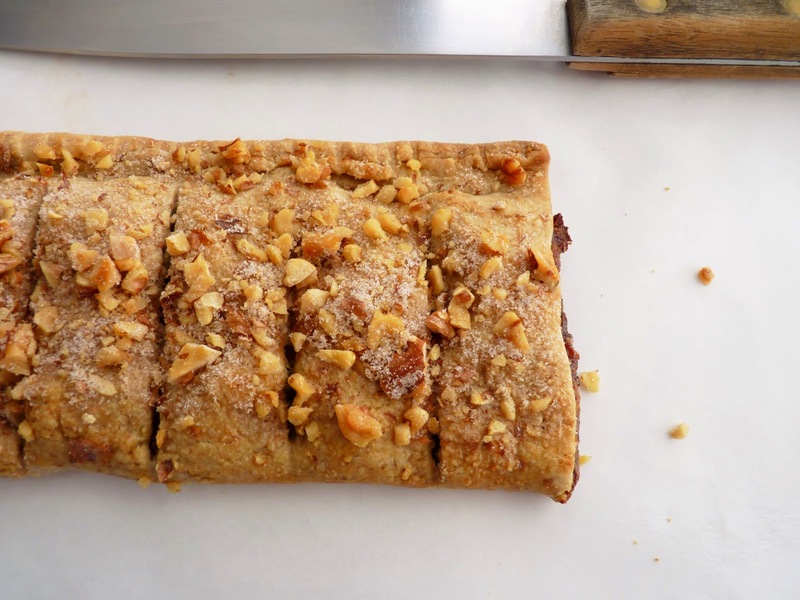 The walnut pastry dough is borrowed from Rose Levy Berenbaum and is very easy to work with in this application. The combination of these flavors and textures are a particularly fun way to savor our prized Medjool dates. Serve a slice perhaps with a small tip of Rainwater Madeira or a strong cup of your favorite java. - Lightly toast the walnuts at 350 degrees F for about 8 - 10 minutes or until they just start to turn golden and give off a light toasty aroma. Watch them closely so they don’t burn and become bitter. - Berenbaum advises against substituting almonds (too hard) or pistachios (too soft) for the walnuts in the pastry dough. - The pastry dough has less sugar and less butter to make it less fragile and easier to handle. The walnuts in the dough should be finely ground to make handing and rolling the dough easy peasy. - After chilling, let the dough sit at room temperature for a few minutes. The dough is ready to roll out if it doesn’t crack when you try to roll it out. - I think the dough is easy to work with but if you find it softens too much, chill it just long enough to let it firm it up but still be pliable. I didn’t need a lot of flour to roll it out but be sure to use enough so the dough isn’t sticking. Use a pastry brush to dust off any excess flour remaining on the surface of the pastry. - You can prepare the pastry and/or the filling separately a day or two ahead and store in your refrigerator. 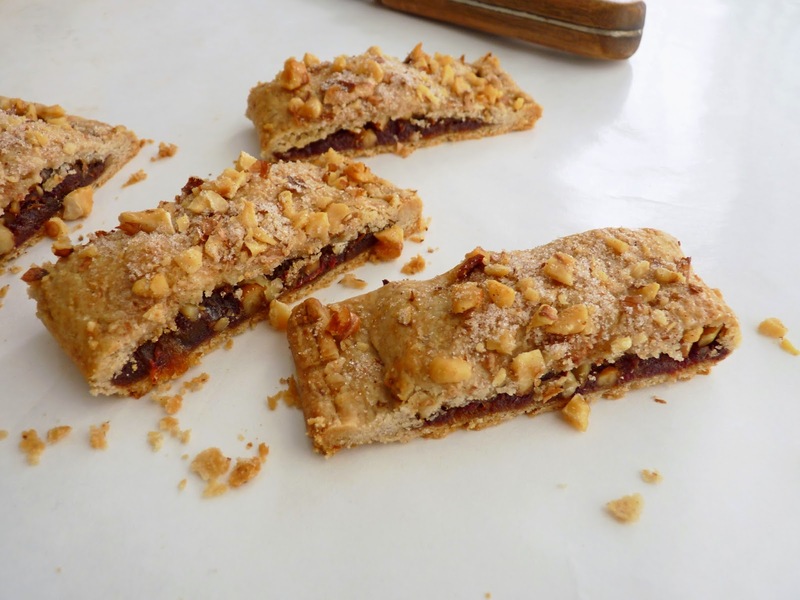 If you make the filling ahead, leave out the walnuts to prevent them from softening. Add them when you’re ready to assemble. - If you’re a date lover, you’ll enjoy Roasted Dates with Sherry and Spices. I like to serve them with a cheese course. And there's a recipe for Oatmeal Chocolate Date Bars in The Global Pastry Table. 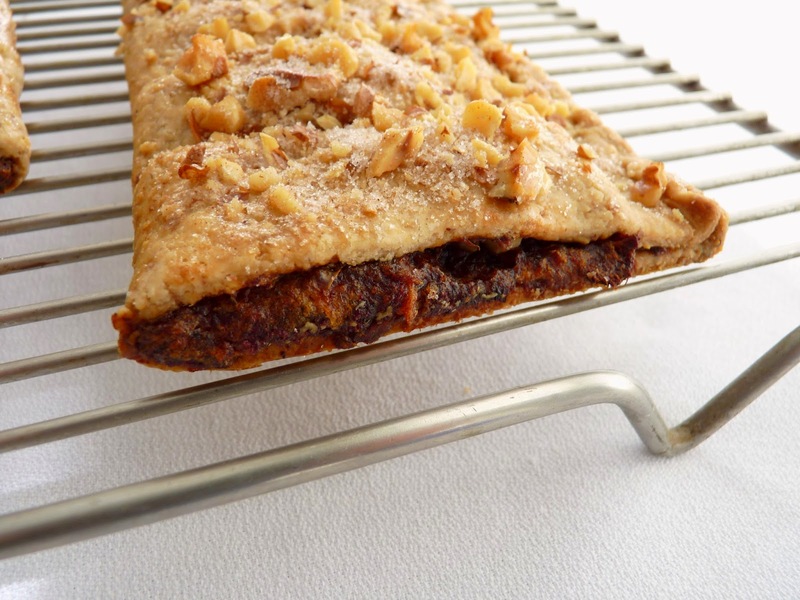 - This pastry dough is also delicious fashioned into a Cranberry Walnut Crostata. For the pastry, subtract 2 tablespoons of walnuts from the 1/2 cup. Coarsely chop the 2 tablespoons into smallish pieces and combine with 1 tablespoon of sugar and 1/8 teaspoon of cinnamon. Set aside as a garnish to sprinkle on top of the formed pastry before baking. Place the flour, sugar, salt and remaining walnuts in the bowl of a food processor. Process until the nuts are finely ground into the flour. Cut the cold butter into 1/2” pieces, add and pulse until the texture looks like coarse meal with a few larger pieces of butter. Whisk together egg yolk & ice water. Add to dough mixture and pulse until it begins to come together in large clumps and there are no dry patches of flour. Turn the dough out onto a piece of plastic and form into small flattened rectangle, Wrap tightly and chill for 30 minutes or until firm enough to roll without sticking. For the filling, pit the dates and remove the stem. 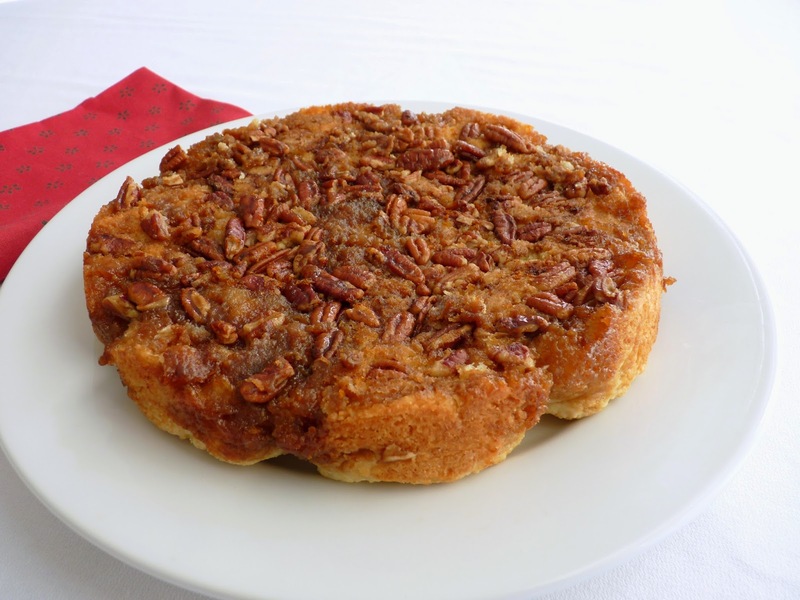 Coarsely chop and place in a saucepan with the coffee, brown sugar, orange zest and cinnamon. Simmer on low heat for just a few minutes, stirring occasionally, until mixture is softened and the liquid is absorbed. It will look like a loose paste. Cool and fold in the chocolate chips and walnuts. When ready to assemble the pastry, place the dough on a silpat or piece of parchment paper lightly dusted with flour. Let it sit a few minutes to take off the chill. Roll into an 18” x 8” rectangle, carefully lifting it often and using a light dusting of flour as you go to prevent sticking. Slide the silpat or parchment paper with the pastry dough onto a baking sheet and chill while the oven heats up. Preheat the oven to 350 degrees F. For the egg wash, combine the egg, water and salt. Take the rolled out dough from the refrigerator and leave it on the baking sheet. Place it in front of you so the long side is closest to you. Make a slight mark at the halfway point on the short side so you know where the fold will be. Spread the filling evenly on the top half the rectangle, leaving a 1” border at the long top edge. Brush the top border of the dough lightly with egg wash. Fold the bottom half of the rectangle over and press the edges to seal. Turn up the edges to make a border and press lightly with the tines of a fork to seal. Cut in half for easier handling and chill until the oven is ready. 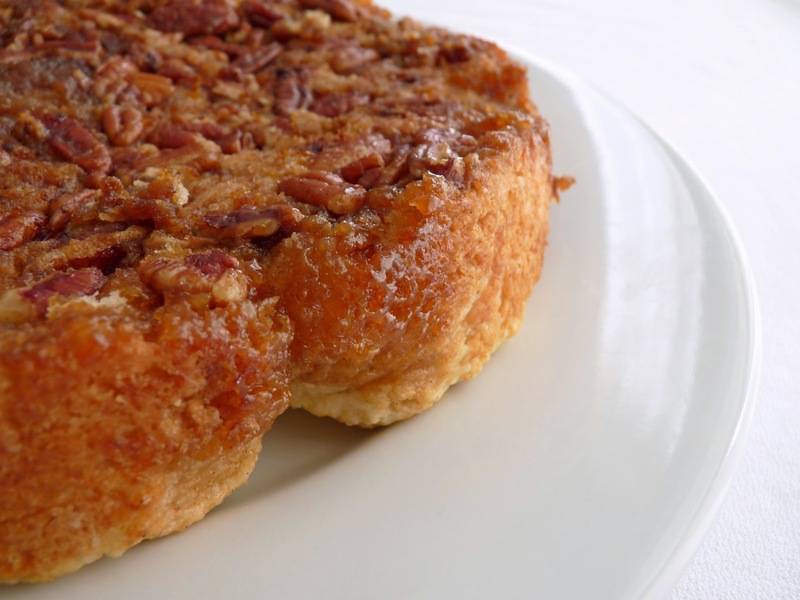 Take a sharp knife and cut 6 slices in the top layer of each pastry. Leave the pastries in tact and do not separate the slices. Brush the tops lightly with egg wash (you'll only use a bit) and sprinkle with the reserved sugar-walnut-cinnamon mixture. Bake until the pastries are a light golden brown, about 25 – 30 minutes. Cool on a wire rack. Cut into slices and serve.